Newtown’s unbeaten home run in the Welsh Premier League comes to an end after a 2nd half comeback from the Nomads. Second half goals from the Nomad’s Danny Holmes and Michael Wilde turned the score around from 1-0 to 1-2 to create a bad start for the Robin’s Phase Two campaign. The plus side was Porya Rio Ahmadi scoring on his debut after joining the club from fellow Welsh Premier League side, Aberystwyth Town. 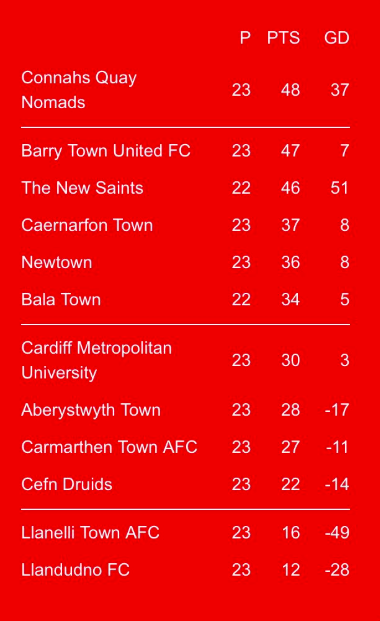 Saturday’s defeat puts Newtown down to fifth in the Welsh Premier League table after Caernarfon Town beat Barry Town United, 2-0. 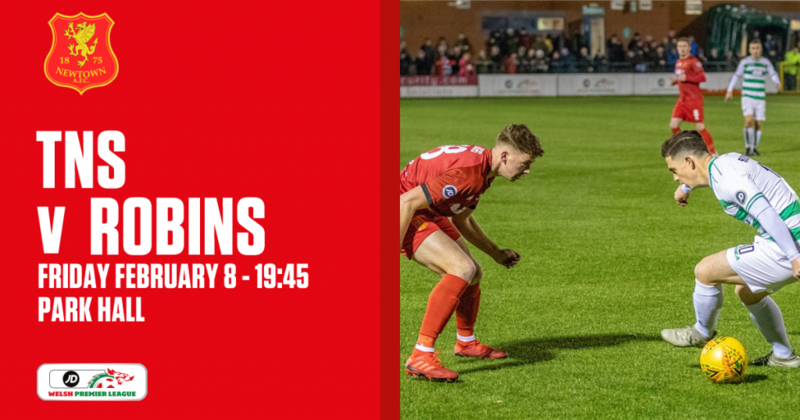 Manager Chris Hughes included the new signings of Porya Ahmadi and Sam Barnes in the starting line-up as Jake Mann, who comes from the Under-19s squad, began life in the first team from the bench. New signing Matty Williams was not named in the squad as the midfielder is currently recovering from a shoulder injury. On paper, the Nomads were seen as the favourites going into the game and they showed why the moment the match kicked off. The visitors created the first chance of the game when a storming run from Andrew Owens opened up Newtown’s defence but his shot placement went straight to goalkeeper Dave Jones. Just seconds later and the Nomads were at the forefront again as Andrew Owens was causing problems again but this time his shot was blocked in the Newtown box. The match started to die down in terms of opportunities for both sides as the hosts were not creating much up front. After 18 minutes, Connah’s Quay had a close chance when Danny Holmes picked out Michael Wilde in the box but thankfully his header was just a whisker over the bar. The opening 20 minutes saw the visitors create a handful of chances to go ahead but they just weren’t clinical enough. On the half hour mark, The Nomads again were hungry to get themselves on the scoreboard. This time Holmes created another dangerous cross Wilde who struck his ball just a tic tac past the post. But the highlight of the first arrived on the 35th minute when debutant Proya Rio Ahmadi put the Robins ahead after slotting the ball into the bottom corner of the net. A dream start for the forward! After the half time break, it was a scary moment for Jones who went out of his 18 yard box to try and intercept the ball from Wilde, he failed to do so as the Nomads forward chips the ball over the roof of the net. 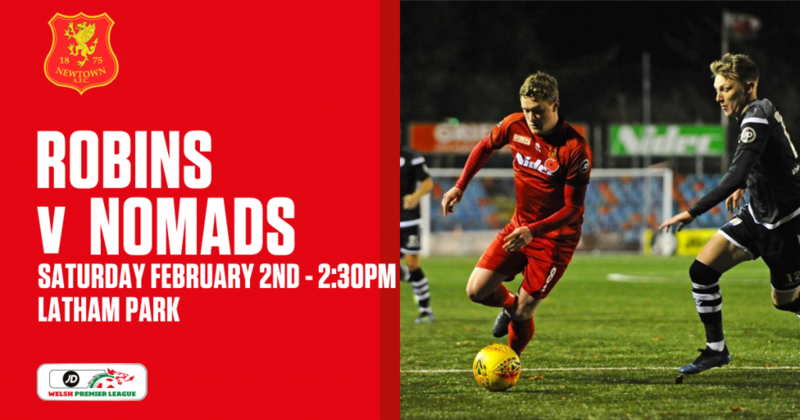 Despite the brave defending from Jones and his defence, the Nomads finally got themselves on the score board when Danny Harrison converts in the equaliser which included a collision with Jones but the goal stood. It didn’t take long for the Robins to respond as four minutes after the equaliser saw Steve Leslie drill his shot straight to the hands of John Danby. With 12 minutes left on the clock, the Nomads completed their comeback when Wilde headed in the winning goal – Jake Phillips with the assist. Newtown however nearly spoiled the Nomads party on the 83rd when captain Craig Williams caught the opponent’s defence half a sleep, finding much room in the box to collect the pass but lofted the ball over the bar. 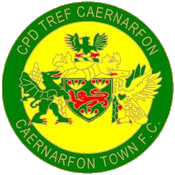 It proved to be the final threat from the hosts as Newtown’s unbeaten run at Latham Park in the Welsh Premier League had come to an end. Newtown AFC: 1. Dave Jones (GK) (13. Jack Perry 70′); 19. T. Craig Williams (C), 6. Jay Denny, 26. Sam Barnes, 3. Callum Roberts, 18. George Hughes, 23. Alex Fletcher, 7. Neil Mitchell (11. Joe Kenton 87′), 10. Steve Leslie (9. Luke Boundford 73′), 8. Nick Rushton, 32. Porya Ahmadi. Substitutes: 11. Joe Kenton, 17. Sam Phillips, 9. Luke Boundford, 13. Jack Perry (GK), 25. Will Evans, 22. Jake Mann. Connah’s Quay Nomads FC: 1. John Danby (GK); 15. Danny Holmes, 5. George Horan (C), 2. John Disney, 6. Danny Harrison, 14. Adam Barton, 8. Callum Morris, 16. James Owen (21. Rob Hughes 45′), 22. Michael Bakare, 9. Michael Wilde, 10. Andrew Owens (19. Jake Phillips 60′). Substitutes: 28. Jon Rushton (GK); 19. Jake Phillips, 21. Rob Hughes, 24. Connor Harwood, 25. Dominic Elsey-Mchugh.